The Compliance Poster Company Mobile Poster Pak™ includes all mandatory state, federal and OSHA employee notices in a conveniently bound booklet. 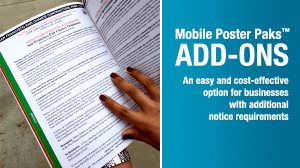 Employers can supplement their Mobile Poster Pak by including optional add-on notices for specific industries, cities, and counties. An add-on is an easy and cost effective update for employers operating businesses with industry-specific mandatory notice requirements or businesses where local laws require city/county notices. Add-ons can only be purchased when you purchase a Mobile Poster Pak, as these are bound into the Mobile Poster Pak at time of print. Select your industry-specific or city/county add-on listed below or call our Compliance Advisors at 1-800-817-7678 to discuss specific postings.